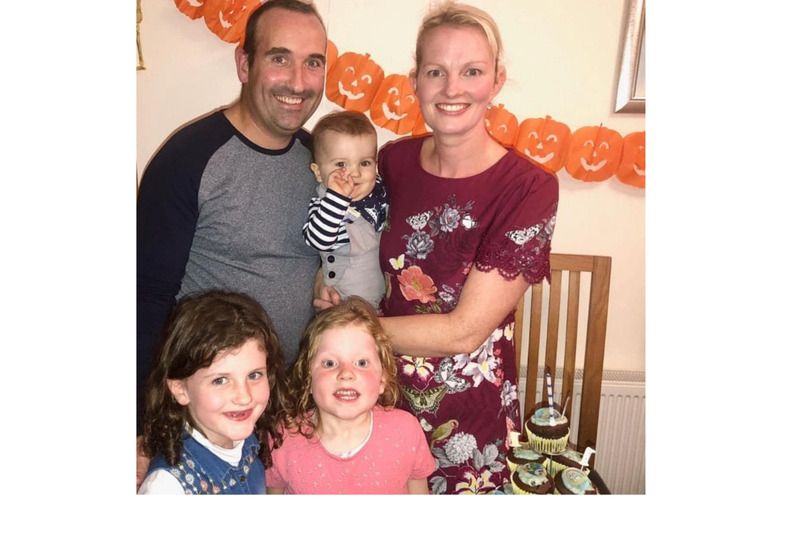 Our good friend Kieran O’Connor (39) former Aghada GAA & Cork Senior Footballer, needs your financial help to support him and his family with current living and future medical expenses to beat Ewing’s Sarcoma Cancer. Including possible travel abroad for additional medical expertise. THE BACKSTORY On 2nd October 2017, after what started out as a throbbing pain in his right ankle, Kieran was diagnosed with Ewing’s Sarcoma. Ewing’s Sarcoma is a rare form of bone cancer and even rarer in adults. Kieran & his wife Sinead were also due their 3rd baby at the time of diagnosis, baby James was born 3 weeks later and Kieran began his treatment within days. Kieran went through aggressive chemotherapy for 3-4 months to shrink the tumour enough so that the surgeons could proceed with his operation. On 14th February 2018, the surgeon operated on the tumour, shaved off 110mm of bone and attached ligament as part of the repair. The operation went well, but the healing process was long and painful. Intensive Chemotherapy resumed after a month and went on until the end of July 2018. By November 2018, Kieran having being out of work since October 2017, was feeling well. All the results were positive and he was planning on going back to work in December 2018. He took part in our “Local Bulls” Fundraiser with his young son James! Confirming the positive mental attitude and strength of Kieran, they dressed down for a special 2019 calendar! A bit of fun to raise awareness of mental health issues and cancer and to raise funds for Pieta House and the Mercy Hospital. THE UPDATE: Over the last few months, Kieran was suffering from persistent pains in his leg and the wound was not healing fully. In January 2019 he had to endure another serious operation & his lower leg was amputated. While trying to recover from the amputation, he started experiencing bad back pains, and last week we were all devastated to find out that his cancer had spread. Kieran is a fighter, he is back on chemo treatment this week battling Ewing’s Sarcoma for the THIRD time in 18 months. THE GOAL: We, his friends, have decided to set up this Go Fund Me page for Kieran & Sinead, Isabelle (7), Ava (5) & James (1). Funds are needed to help Kieran with all aspects on further treatment and care, as well as potential prosthetic costs following his lower leg amputation and to help support Sinead and their 3 young children. WE WANT KIERAN TO CONCENTRATE ON BEATING CANCER AND GETTING BACK TO GOOD HEALTH. 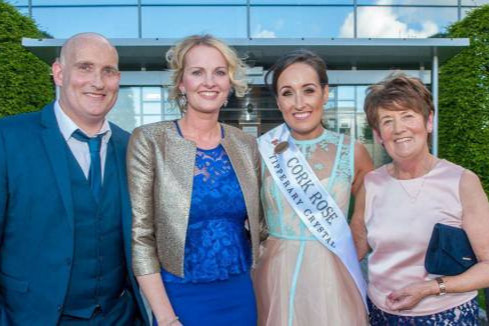 We are appealing to the whole community of Aghada, Cork and beyond to support this fundraiser for “one of our own”. 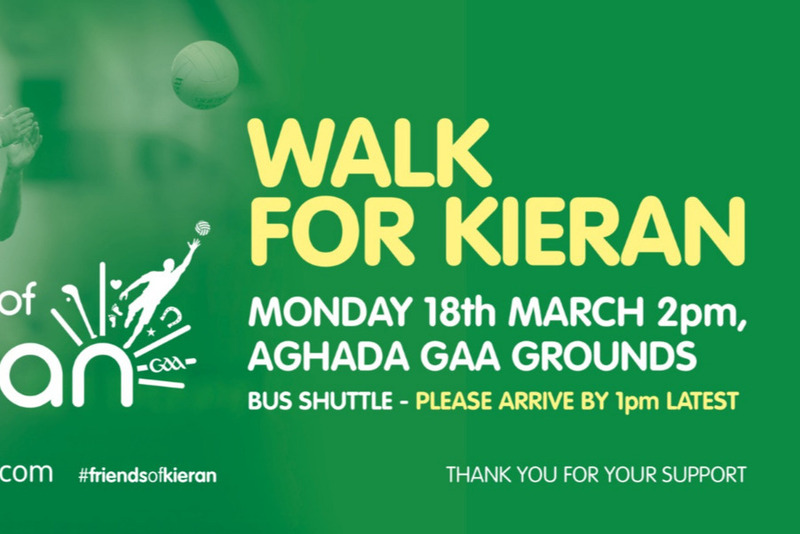 Please help us to reach our goal for Kieran, Sinead & Family. Donations via This Go Fund Me Page or directly into the below bank account, or to any of the named finance committee members - contact friendsofkieran@gmail.com for further details. What a day, what a community!!! Sincere thanks to everyone for your presence on Monday, it meant so much. INCREDIBLE donation total from bucket collection amounted to €16299.37 !! The support offered to Kieran & his family over this past week has been nothing short of incredible. To each and every one of you, a heartfelt thanks! 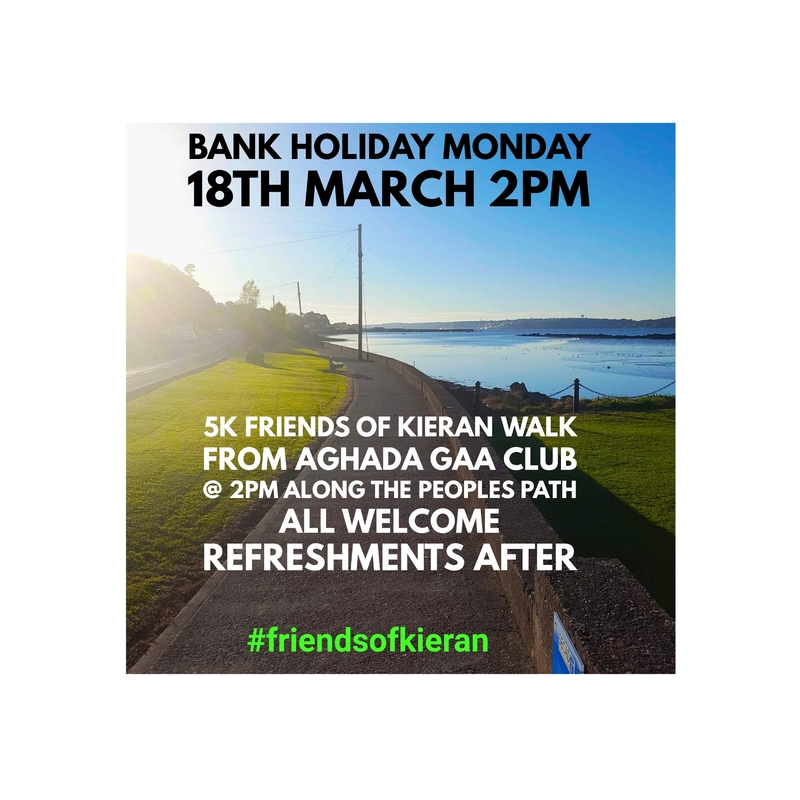 This Bank Holiday Monday we are having a Walk For Kieran at Aghada GAA Grounds at 2pm. 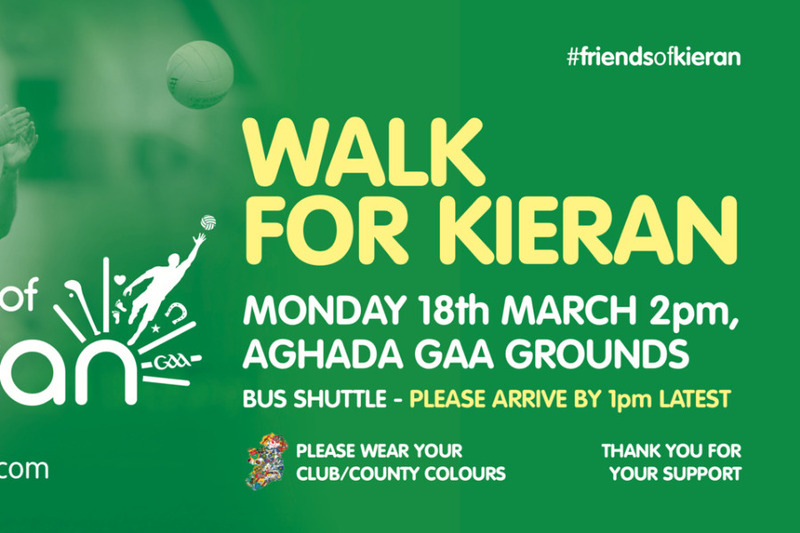 It would be fantastic to see you there to show your support for Kieran and his family. Please see the event details below. All Welcome. •	Buses will depart every 10 minutes, large buses will be available for buggies etc. A satellite carpark system using shuttle buses will be in operation on the day between 12 noon - 1.30pm and will return to the same location post walk. Buses will depart every 10 minutes. •	Those living in the villages of Saleen (Church), Whitegate (The Bus Stop) and Aghada (Church) can walk to designated bus pick-up point in each village as shown above. To all who have answered the call, we salute you. Your response has been absolutely staggering. Our initial gofundme target has been reached already.! Let’s all take heart from this and keep it going so that we can do our utmost to support Kieran and his family through this very difficult period. Thank you to each and every person for your donation. The response & support has been amazing.